Its been years, in fact my own childhood years, since I visited a museum in York. As a parent I’m always grateful to find a good museum that is reasonably priced or even better free to visit, providing us with a fun & interactive educational visit and a dry and warm haven from cold half terms! On arrival the museum staff were extremely helpful, pointing out extra helpful information for our family, such as the complimentary baby carriers in the buggy park and pointing us in the right way for family facilities like the picnic room etc. We started out by eating our lunch; the room wasn’t the most glamorous of locations but it provided us with a practical place to eat lunch. Our table was filthy (thank heavens for wet wipes) We only realised after we finished our lunch that there were self service cleaning sprays, hand gel and cloths! Handy to know for future visits. Onwards to the museum, The first part of the museum was more of interest to us than the kids as it documented York’s chocolate history with period rooms and chocolate timelines. Next we all really enjoyed the toy museum and spotted several toys that are apparently now retro relics that we remember playing with! The kids got a chance to dress up and play with a few toys at the end of this exhibit. In the newest exhibition we saw how fashion, food and life has changed over the past 400 years and just how fashion repeats itself over the years and that obesity isn’t just a modern day occurance. 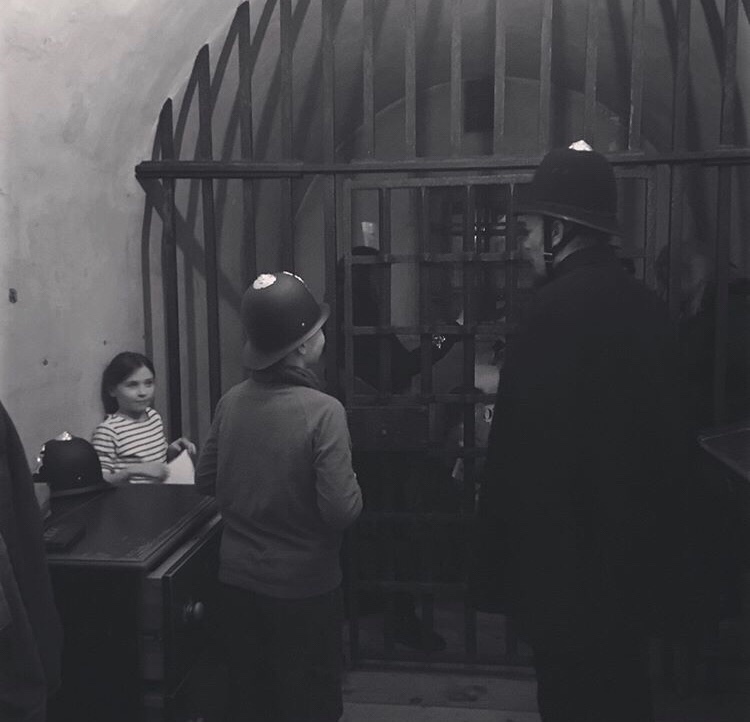 Then we set foot into the Victorian days down in Kirkgate Street. 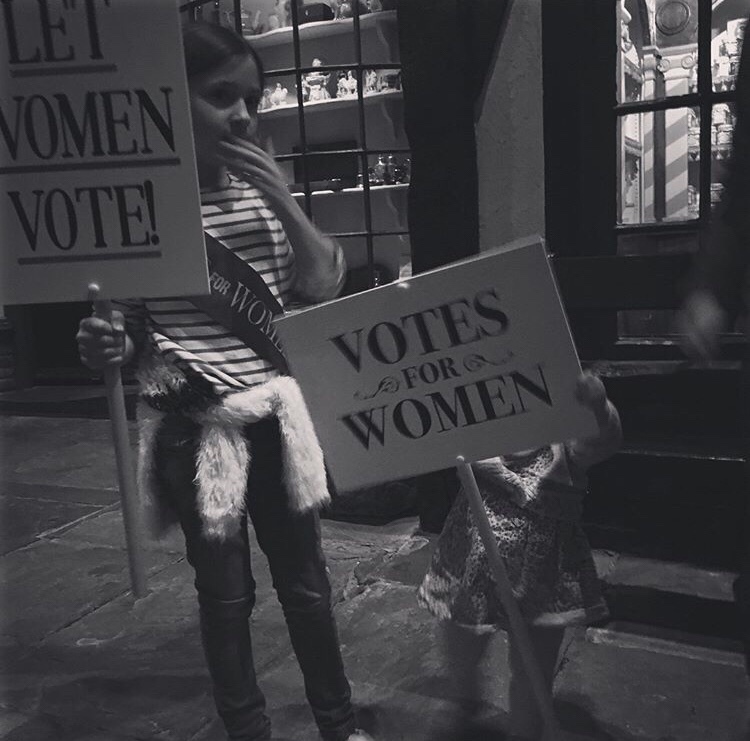 This week the museum was showcasing the suffragette movement and so we were encouraged by an enthusiastic suffragette to don sashes and placards and march and chant through the cobbled street calling out “Votes for women, deeds not words!” An official Bobby on the beat took us to the local jail and locked us all up! It was so realistic that Teddy was very concerned that we were all in Jail! We all thoroughly enjoyed experiencing this part of the museum, with the shops that existed in York in this period. We even got to purchase some yummy chocolate mice from the ye olde sweet shop. Other Victorian highlights for us have to be the street turning from day to night, and experiencing all the various sounds that were heard back in that period. A really great interactive exhibition and museum collection. We enjoyed this area so much we ran out of time to visit the World War 1 exhibit and the York Castle Prison area, so plenty left for us to make the most of our York Cards and return again. You can’t take pushchairs around, so maybe bring your own baby carrier, although there are a few available to borrow. There is a self-service craft room for the kids, if you’re wanting to spend more time in the museum. We made suffragette rosettes with the craft supplies laid out. If you’re local or planning on making more visits to York then we recommend a museum trust card that cost us £10 per adult direct debit (free for kids) to visit the Castle Museum, Chocolate Story and The Yorkshire Museum. This also gives us some benefits such as a discount to the cafe and special previews to events. There is a cafe selling food and hot drinks etc. If you’re not as frugal as us picnic goers! There are baby changing facilities and more toilets in the Kirkgate Street exhibit. Make sure your little ones’ legs aren’t already tired as our 4 year old struggled to walk around after a walk from the bus stop to the museum! "It didn’t go to plan…."